A new 'reconcilement law' is expected to speed up the return of businessmen who fled Egypt due to corruption allegations, giving them immunity from imprisonment or travel restrictions, according to justice ministry officials. "The law will encourage businessmen to settle their financial disputes," said Sherif Omar, head of the legislative committee at the justice ministry. Businessmen who have already been convicted of offences will be subject to retrials without being legally bound to attend the court sessions, he added. The Shura Council (lower house of parliament) ratified the law on Sunday. "This is an important step to attract investors and boost confidence in the Egyptian economy. This will definitely return capital that has been lost since Mubarak was ousted and pump it back into the economy," an official at the justice ministry told Al-Ahram Arabic newspaper. The law states that a committee, presided over by the justice minister, will include representatives from the foreign ministry and several governmental watchdogs to monitor the reconciliation process. It is expected that such steps will lead dozens of businessmen to return to Egypt, and will contribute to the development of a sound investment environment, explained Omar. Several businessmen and investor groups have welcomed the initiative and said it as an important step towards encouraging much-needed investment in Egypt. "This is what we have been urging the government to consider for a long time. Businessmen need to feel safe and be able to take investment risks without the threat of being legally pursued. We are glad the government's mentality towards businessmen is changing," said Hussein Sabour, head of the Egyptian Business Association. Several opposition groups and civil society organisations have opposed the government's move. "The new law will allow the executive branch to oversee the reconciliation process without real judicial supervision," the Egyptian Initiative for Personal Rights explained in a statement on Tuesday. "The committee could easily be politicised and pave the way for the return of Mubarak-era officials," the statement added. Since Egypt's revolution in 2011, a number of Mubarak-regime figures have been tried for profiteering and financial corruption, including strongman Hussein Salem, ex-ministers Rachid Mohamed Rachid, Ahmed El-Maghrabi and Zuhair Garana. The money maybe will return. One time. But common sense will be laid off. Forever. Although the new committee is a result of a law of a sort, the principle is terrible. The committee, evidently, is going to pardon people who have stolen millions - in some cases tens of millions - from the state. At the same time, small thieves and pickpockets caught on the street are going to be put in prison. If one desperately wants to pardon thieves, it must happen according to a law that encompasses all thieves. And unless you want to permanently legalize theft, there has to be a time limit for how early thefts are going to be pardoned. All in all, this does not promise well for the future of Egyptian economy. The message is the corruption is not that serious. If you are caught, you can buy your way out. Corruption is enormously serious for a society. Public outlays don't reach the intended purposes. Instead of going to roads and schools, a big part of the money ends up in the pockets of civil servants and their private benefactors. Tax revenue never reach state. 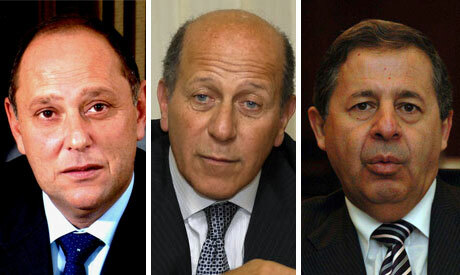 Does Egypt really need or want these "businessmen"? Does Egypt really want business men and women who stole money from it's citizens to return to Egypt to "reinvest" in the economy? What will prevent them from stealing again, since the only penalty seems to be that they have to give back the original amount they stole, if they get caught? Why not at least make them pay back all the original amount AND all they earned with that money, plus a big fine for stealing? LOL! Does this not just say to people that they can steal from the country... if they happen to get caught in the future "no problem" just pay some money back and everything will be fine. Does this send a strong signal that corruption in Egypt is not welcome? No, of course it doesn't!